This salad brings a simple elegance to any meal. It’s also an easy dressing to make with just four ingredients! You can use any low sugar fruit spread or jam. In this recipe I used the Wegmans Triple Fruits flavor. The light berry flavors combine so perfectly with the sweetness of the honey and the mild tartness of the cider vinegar. The flavor is all in the dressing so there is no need to add strawberries or raspberries – if you’re watching your calorie or carb intake. If you’re on maintenance, add them – especially strawberries, as the heart-shaped silhouette of the strawberry tells you that it is a good for you fruit. Note: If you want to add additional ingredients that are low-carb and low calorie, try sliced mushrooms and red onions. 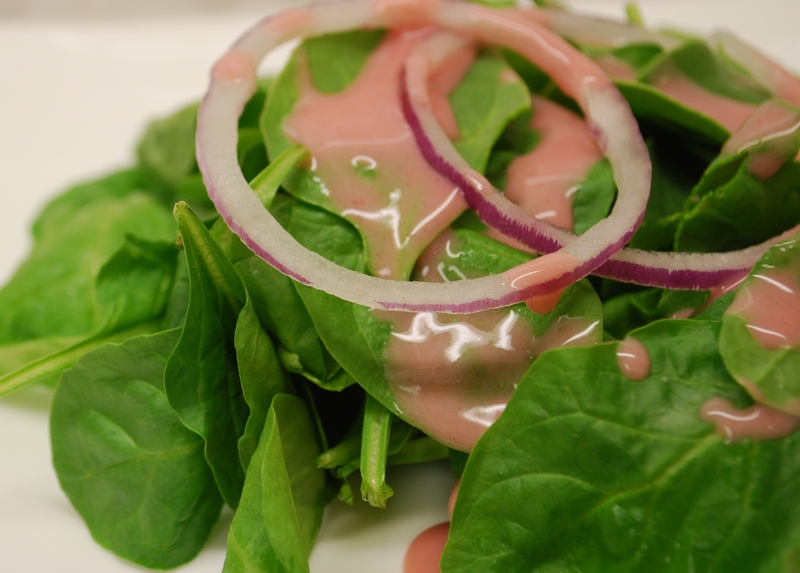 This recipe makes 7 servings of 2 tablespoons of dressing per salad. Directions: Mix ingredients in the order listed in a small food processor, blender or Vitamix. I love the Nutribullet, which works just as well as my Vitamix. Don’t use just LOVE LOVE LOVE 4 ingredient dressings!